One of my favourite things in life is cheese. I once had a go at being vegan, but I only lasted a month. I didn’t miss the meat as much as I thought I would, however I definitely missed the cheese. I even tried some of that imposter soy “cheese”, but the sheer horror of that product alone catapulted me straight back into omnivorism. No, some things just can’t be substituted. After all, “wine and carrots” just doesn’t have the same ring as “wine and cheese”. It was my mother who once bought some Danish fetta that she found a bit nay-nay. As she hates wasting food, she set about rescuing it from a trip to the local landfill. She cut the block up into small pieces, threw some herbs into a jar along with the cheese and filled it up with olive oil. She then left the jar alone in the fridge for a couple of weeks. When she came back to it she found that she had an incredibly flavoursome herby, garlicky, smooth spreadable delight which left many other commercial marinated fetta for dead. I have as a result been making marinated fetta exactly this way for years. This is seriously easy and once you’ve done it you’ll want to do it again. A good thing also to do is once the jar starts to get low, is to slice up another block of fetta, empty the contents of the original jar into a bowl and start over. I put the new pieces on the bottom of the jar and top with the older marinated ones. You will need to top up the olive oil and make sure all the herbs are tucked under the surface of the oil to ensure nothing goes mouldy. 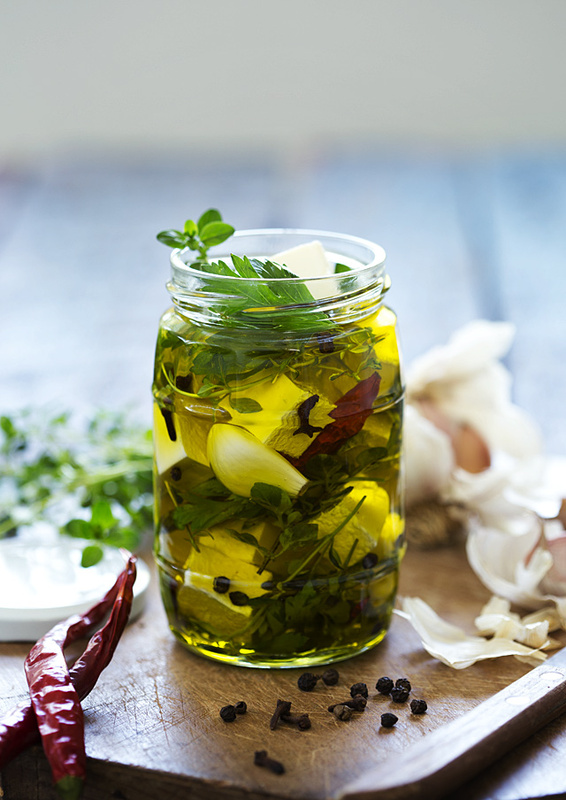 Make sure you always keep the jar in the fridge as unrefrigerated garlic in oil is a botulism risk. Presto, now you have a jar of delectable marinated feta to spread on toast or crackers, to drop into soup or toss into a salad. If you finish the jar and decide for whatever reason not to fill it up with cheese again, whatever you do, don’t throw out the oil. Drizzle it over salad or roast vegetables with it. Believe me, you’ll thank me for it. Prep time: 20 minutes. You will need a medium sized glass jar which has been sterilised. Cut the fetta into 1.5cm (1″) square pieces. Layer the fetta alternately with the herbs and spices making sure the long sprigs are tucked down the sides of the jar. Fill with olive oil up to the top. Leave for at least two weeks in the refrigerator before eating. The jar of fetta with the oil and its beautiful herbs was gorgeous enough on its own and certainly didn’t need much in the way of propping. I decided to scatter the ingredients around the surface and around the recycled jar which housed Turkish grape molasses in a former life. The vintage chopping board was an op-shop find and the timber surface was made out of recycled fence palings. The only light used in this image was window light. No. Wine and carrots. Yes. Wine and cheese. And I’ve never marinated my own, until now! Thanks!